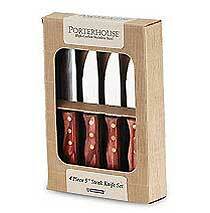 Set of 4 High Carbon stainless steel Gaucho style knives with rosewood dishwasher-safe, polywood handles. Pointed serrated edge blades are perfect for cutting large steaks, prime rib etc. Includes a 25 year warranty. Made in Brazil by Tramontina. Tramontina Professional forged knives undergo a precision manufacturing process consistent with the highest standards for professional kitchen cutlery, forged from a single solid piece of premium high-carbon stainless steel for unrivaled strength and durability. The design of the handle maintains the traditional style preferred by executive chefs with an ergonomic emphasis on perfect balance and a firm, comfortable grip. As good as the best steakhouses offer. THESE ARE EXCELLENT STEAK KNIVES AND i USE THEM DAILY. Best purchase I made on steak knives thus far. So ridiculously inexpensive. love the size and the way they look. Shopped around for different kinds and you can pay up to $200-$500 but I found out there was no need. Totally recommend these knives.